The Valiants high-definition, 10.1? 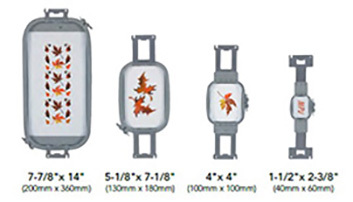 TruView IPS (TFT) LED Screen brings embroidery designs to life with over 16 million vivid colors. Adjust thumbnails and magnify on-screen designs up to 200% to easily spot a design flaw before stitching. Personalize your screen saver, upload images and photos, plus use the Mpeg-4 movie/video function to spark more ideas. The Digital Camera lets you see from the needles point of view, so you know exactly where the needle will drop. Also, you can use the Perfect Positioning stickers included with your Valiant to place every design with extreme precision. The 5 LED lights help illuminate your work area and also come with dimming settings to create your perfect workspace. 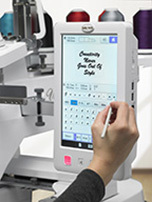 With the Valiants editing features, you can combine, reposition, resize, rotate and mirror embroidery designs and watch as the changes instantly appear on the LCD screen. Alter design elements individually, or group them to easily move or edit them collectively. 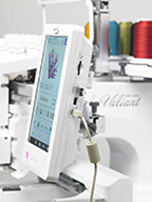 The Valiant has many features built-in to help you concentrate on the art of embroidery instead of the mechanics. 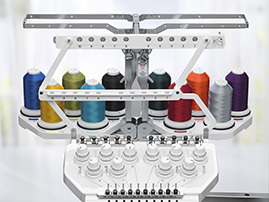 The 10 LED spool stand lights help keep your thread colors coordinated, and signal when a spool needs to be changed. 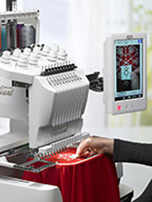 Plus, the push-button needle threader makes thread changes effortless. 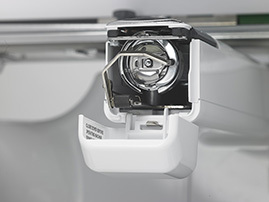 The convenient bobbin system with a front-loading, vertical hook means you can change bobbins without having to remove your embroidery hoop. Choose from random, vivid, gradient and soft and watch as your design is transformed in an array of color combinations. Have a favorite color in mind? Pin it to the Color Visualizer, and the Valiant will be sure to use it in the next set of color suggestions. 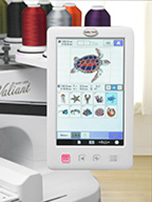 Choose from more than 120 built-in embroidery designs then rotate, merge, color sort, group and more all on screen. 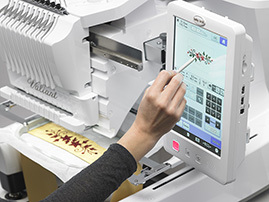 Embroidery finishes fill faster than the blink of an eye. 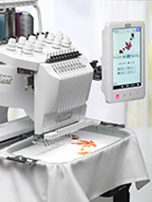 Youll love the estimated embroidery time display stitch count, embroidery progress bar and stitch simulator. With Multi-line text, character spacing, grouping and character insert capabilities designing with the 41 included fonts has never been smoother.